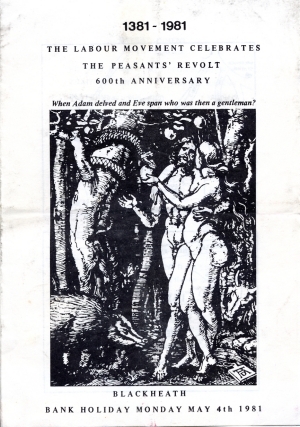 A picture posted as part of the ongoing argument within the Labour Party has prompted me to dig up an episode in local history - the commemoration of the 600th anniversary of the 1381 Peasants Revolt, held on Blackheath in 1981. 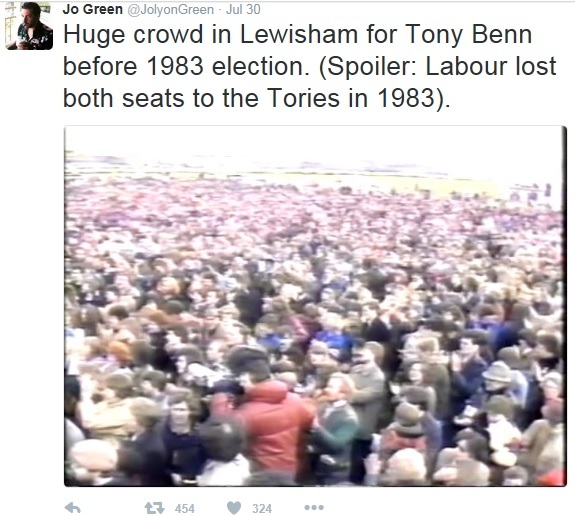 Jolyon Green published a crowd scene on twitter with the caption 'Huge crowd in Lewisham for Tony Benn before 1983 election (Spoiler: Labour lost both seats to the Tories in 1983)'. Subsequent discussion on twitter seems to have narrowed this down to Blackheath in 1981, within the borough of Lewisham. Tony Benn did indeed address a crowd there, the occasion being an event to commemorate the 600th anniversary of the Peasants Revolt. In 1381 the rebels had gathered on Blackheath before heading into London, so it was an obvious place for the commemoration on May 4th 1981. As well as speakers there was music on this May Day bank holiday from Squeeze, Frankie Armstrong & Leon Rosselson, Traitors Gait, Rubber Johnny, Bluebird and Icarus. So it was more of a festival than just a political rally, and certainly not specifically a 'Bennite' rally. 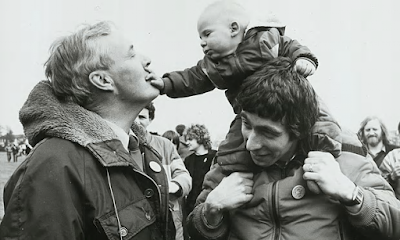 Other speakers included Jack Straw - pictured below with Benn and the young Will Straw at the Blackheath event - and Canon Paul Oestreicher, then parish priest at the Church of the Ascension in Blackheath. The latter is an interesting figure who was chair of Amnesty International, hence no doubt the continuing connection between that church and Amnesty (a great Amnesty book sale takes place twice a year at the church). Allan Boesak, the South African anti-apartheid activist, gave a liberation theology-inspired sermon taking as his starting point John Ball's 1381 Blackheath sermon with its famous statement 'Matters shall not be well in England until all things are held in common' (Boesak's Blackheath sermon is included in his book 'Black and Reformed: Apartheid, Liberation and the Calvinist Tradition'). Does anyone have any memories of the 1981 event? As for its contemporary political relevance, I don't want to get into internal Labour politics here. Jolyon Green's point seems to have been that large left wing rallies do not necessarily translate into Labour winning elections. It is a little misleading to compare Blackheath in 1981 to a current day rally of Corbyn supporters, the former was as we have seen a broader cultural festival, the crowd weren't there just to listen to Tony Benn. But it is historically accurate to note that despite the left sometimes being able to mobilise large numbers on the streets in that period (maybe 250,000 at London Campaign for Nuclear Disarmament demo in 1981, where Benn also spoke) it was the Tories who won the 1983 general election by a sizeable majority. Lewisham East was won in 1983 by Colin Moynihan, who went on to be the Conservative sports minister at the time of the Hillsborough disaster. Moynihan's victory was no doubt assisted by the fact that Polly Toynbee stood in the constituency for the short lived Social Democratic Party, which had split from Labour to join with the Lib Dems. Lewisham West was won by John Maples who, like Moynihan, held his seat for the Conservatives until losing it to Labour in the 1992 election.